It is hard to believe that a year has passed already. When you get older, the holiday season is not so much about the gifts as it is about the people. The holidays are a time to re-connect with friends and family and to discuss what happened during the year – both bad and good. So this is the season in which we like to re-connect with our “mobile home park family” and show everyone how much we appreciate knowing them. To that end, we have two gifts for everyone who reads this newsletter. The first is the Frank & Dave Christmas Show, which we have been lovingly producing for nearly a decade. We write the songs, we write the skits – it takes way too much time. But the result is a lot of fun and one of the few things we write that our own kids find funny. The other is the annual CD update. 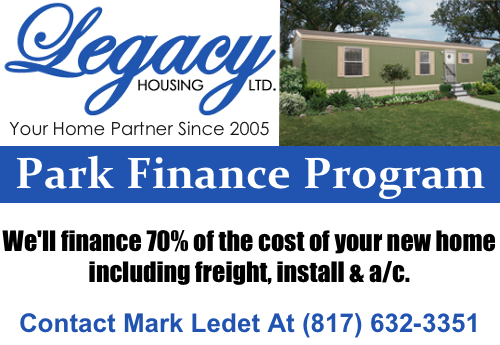 We don’t charge you a penny for this, and yet we spend hours on it, to keep everyone up to date on changes in the industry and the latest advancements in how we buy and manage mobile home parks. So don’t forget to pick up these two free gifts when they are offered to you. We’d put a ribbon on them, but we can’t tie that many ribbons. But didn’t you tell me that RVs don’t count when you evaluate a park? Sure did. That’s when you’re buying a park. But what we’re talking about is filling those vacant lots post-closing. We would never value RV income the same as mobile home income, as RVs can move at the drop of a hat, whereas mobile homes are stuck for life. But once you own the park – based on mobile home lot rent valuation only – every penny of extra revenue you bring in goes in your pocket, regardless of whether it can be pulled by a car or not. If you ever reached 100% occupancy and had that one final mobile home that wanted to move in, you could always non-renew one of those RVs and make way for the “park equity builder”. So there’s no way that having a ton of RVs in your vacant lots can be a bad thing – particularly if your goal is to make money. When you buy a mobile home to fill a vacant lot, it can cost you $20,000 to $30,000 when you include site preparation, the home, the move, the set, the skirting, the AC, the deck, and the utility hook-ups. However, when you move in an RV the cost is zilch. If you have to fill 20 vacant lots, that’s going to cost you $400,000 to $600,000 in cash for mobile homes. If you fill those 20 lots with RVs, the cost is zero. Which would you rather pay? It’s a fact: RVs are more attractive than mobile homes. That’s always been the truth. There is a kind of art form to RVs – go to the RV/MH Hall of Fame in Elkhart, Indiana if you want proof. The RV has always been the bastion of the affluent, and the designs are significantly better in all regards. While mobile homes try to look like a normal house, RVs have not chip on their shoulders, as they’ve been cool since the 1920s. There was an RV in the Neiman Marcus catalog a few years ago, while there has never been a mobile home featured (and unlikely ever will). Typically, the guy in the RV is the most affluent in the entire mobile home park. His RV is worth maybe three to ten times more than the surrounding mobile homes, and he drives a new car that is towed behind. That’s not to say that all RV users are rich, but the majority are at least middle class, and that’s a superior demographic to your minimum wage clientele. RVs give your park a certain ambiance that is higher than it would have otherwise. Even if you have a ton of capital, you cannot fill lots that quickly by buying and bringing in mobile homes. It takes time to get them delivered, and then you have to set them up and get them occupied. A fast operator can process a couple homes a month. But you can fill 10 lots in one day with RVs. We had that happen in our park in Pontiac, Illinois. We picked up around 10 RVs in our park unexpectedly – virtually overnight. Check the permit for your park and see if you are allowed to have RVs and, if so, if there are any restrictions on the quantity you are allowed to have. Build a really good web page for your park and make sure that if someone enters the name of the city your park is located in and the word “RV” that your park pops up on the RV park list. Contact the sources of large quantities of RVs that stay for months and/or years. These includes announcements of new construction projects (pipelines, highways, refineries, etc. ), new employers who are hiring, and annual events such as fairs and the Indy 500. Put informational flyers in places that RVs frequent, such as nearby rest stops and propane dealers. Put a large, attractive sign in front of your park that says “RV’s Welcome”. Marketing to RVs in not costly, and you can go from 0 to 60 in about a week. Is My Park Manager An Employee Or An Independent Contractor? Many park owners ask me whether they should set up their park manager as an employee or as an independent contractor (a “contractor”). The latter is the easiest choice as it requires less work on management’s part, no tax withholding and no workers compensation insurance. Bingo! Sounds like a good choice. But, which is the choice that is in compliance with the tax law, the Fair Labor Standards Act and your state’s wage laws? 5) The permanency of the relationship – short duration working relationships are easier classified as contractors. Other factors such as what any written agreements between the parties say, and how they are paid now are also considered, but less so than the economic reality of the relationship. If the decision is borderline, the safe call for management is to pay the worker as an employee. This decision will likely keep management out of court over workers compensation benefits and wage law violations claims such as claims for overtime pay owed. Second, if the park manager is an employee, can management pay them a salary (exempt status) or do you have to pay them hourly (non-exempt status)? Workers labeled as “Administrators” or “Professionals” via either educational training or work history qualify for exempt status and thus can be paid a salary. Many park managers fit that definition. However, for an employee to be salaried, they must earn at least $455/week in compensation. Thankfully, the “fluctuating work week” rule allows a non-exempt employee to be paid a set amount regardless of how many hours they work in a week. If this is the case for your business, put it in a written contract. An attorney who defends wage related lawsuits recently told me he didn’t think there was such a thing as an independent contractor anymore. This was said partly in jest, but his message that wage related lawsuits are hard to defend is real. This article serves as a basic overview of federal employment and wage laws. It’s always best to check with your CPA, lawyer, or Human Relations expert for the best answers for you in the state where you operate. It’s amazing how a perfectly good mobile home park can be ruined by tiny details. These little screw-ups cause the potential tenant/appraiser/ banker/buyer to get the wrong first impression, and damage your business in a significant way. Don’t let your park be hurt by these easy-to-prevent, low cost mistakes that many operators make. Nothing can make your park appear more attractive and valuable than a good haircut. Mowing is one of the most important things you can do to enhance value. While many park owners know they should mow every week or so, they fail to properly edge or burnish the roads, sidewalks and pads. The grass in a park should never grow anywhere but in the yards. All roads, parking pads – every paved or concrete surface in the park – should be free of grass and weeds. So break out the weedeater, edger and round-up if you want to get the job done right. What’s sets the first impression to your park more than … the first thing you see? The entry sign must be sharp and well maintained. The whole entry, for that matter, must be held to a higher standard than anywhere else in the park. We believe in quality signage and liberal use of white vinyl fencing and other decorative touches that give it a “quality” look. And the good news is that these are not that expensive. Look at the photos above. That missing shutter is a $25 item to fix. If it makes the appraiser increase your cap rate by a point, that $25 shutter cost you maybe $100,000. Go lot-by-lot throughout the entire park and fix the one worst thing in every lot. Aluminum foil in windows becomes white mini blinds. That missing piece of skirting is replaced with a piece off the back of the house (that nobody sees). Use your inner Martha Stewart to increase the level of play on every lot. For those who have owned apartments: good news. Mobile home park makeovers are cheap and quick. An apartment complex roof or paint job can cost $100,000 to $500,000 and take months. The same impact in a mobile home park can cost $5,000 and be complete in a weekend. Mobile home parks have a lot in common with Hollywood set design – they are both only skin deep. If you want to make your park worth more, then don’t overlook attention to detail. Little things mean a lot. The difference between a great park, and an average park, is often nothing more than a little extra paint, mini-blinds, shutters and TLC. There is a general myth about the largest operators and their level of play. It’s kind of like David and Goliath. Goliath looks tough to beat, and then you find that you can defeat even the largest operators if you are smart and have the right rock. In fact, some of the aspects of large ownership actually create weak spots that you can take advantage of. What is a large organization? It’s just an affiliation of a lot of individuals. Nothing that magical to it. You are basically competing with just plain people, and many are not that good at what they do. While professional football teams field a bunch of the top talent in the nation – and can collectively beat any high school or college team – the quality of talent in most mobile home park operations is not that high a hurdle. If you have good sales skills and ambition, you can outmaneuver the largest REIT person in the field. So don’t think that you’ve been outmatched. The very structure of most REITs makes them slow to respond. This is one of their biggest Achilles’ heels. How many deals have we beat the REITs on by getting the contract to the seller same day, or agreeing to a 20 day due diligence period? Too many to count. Just like the dinosaurs were killed by cavemen who could run circles around them with spears, most REITs are too bureaucratic to maintain a high level of play in a competitive world. Committees have never made for effective leadership. Does anybody remember the mobile home article 20 years ago in which the CEO of Champion homes would go the factory once per year and pick out the exterior colors and carpets for all of the models in one day. Here’s a guy who has not personally sold a home since the time of Herbert Hoover picking out the colors that would determine customer acceptance for the entire line of products – based on his personal tastes and whims and without any market testing. Crazy! We see deals all the time that are passed on because the leader is not aware that Kansas City is no longer the meat packing capital of America, or that Detroit now has about as much tech employment as auto industry. Worse yet, many of these folks are surrounded by “yes men” who even egg the lack of reality on to new heights. We all serve the same customer – large and small. The REITs do not have more upscale customers than mom & pop (although they may pretend that they do). The only true lifestyle choice operator in the U.S., in our opinion, is ELS. Sam Zell’s customers are better than yours, and there’s no point in arguing the fact (for example. 90% of ELS customer buy their homes for cash). But that’s not to say that there’s no more money in affordable housing communities with a ton of minimum wage earners (just look at the ELS dividend vs. the one you pay yourself). You can’t “break into a better class of customer” when you get bigger, because this industry is all about serving the folks who can’t buy a stick-built house. Even though we are the 10th largest owners of mobile home parks in the U.S., the last thing we ever want to be is another “big” operator. We have been clobbering them for two decades, and our worst nightmare would be to morph into the very thing that we know does not work as a business. No matter how large you grow, try to maintain the speed and focus of when you bought that very first park. 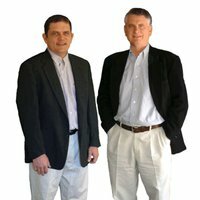 For a good old fashioned spoof of the industry, as well as important information on the trends we saw in 2014 and the predictions for 2015, then don’t miss the annual Frank & Dave Christmas Show. It’s got holiday songs, skits, and special guests (including Santa, of course). So grab some egg nog and have a seat by the fire and let Frank & Dave usher in that holiday spirit for you. We work on this show all year, and the material is always new. So please join us for the only mobile home park Christmas show on earth, and learn who’s been naughty and nice in the industry in 2014. Watch for the sign up announcement in the coming days.